Kong Foam Training Dummy -- Large. $9.99. This dummy is one of the firmest training dummies available. The lighter weight compared to some other dummies will cause you not to be able to throw it as far, but if you are looking for a firm training dummy you may want to give the Kong a try. "It is well made and should endure many throws into the lake." Our dog, Maggie absolutely loves to retrieve and she loves the water too. This retrieving toy is perfect for her. It is well made and should endure many throws into the lake. I like it a lot. Use it for dock diving with my GSD who has a hard mouth (biting hard and holding on is what he is supposed to do). This held up pretty well. I would buy them again. Closed cell foam construction is ideal for training on land and in water. Get smart about training with the KONG Training Dummy. 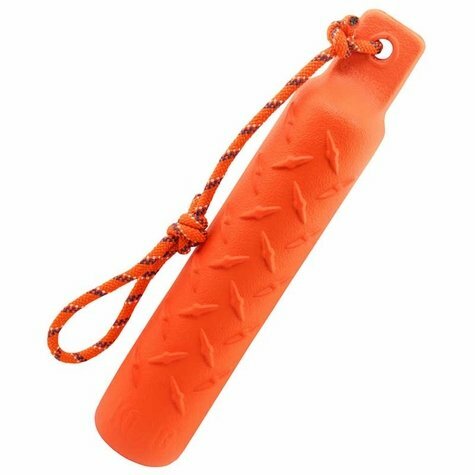 This closed cell foam dummy is a great toss-and-retrieve tool that teaches dogs to use a soft-mouth carry. Floats extremely high for water retrieves. Tough and sturdy for long lasting training. NOTE: Kong Training dummies are durable but not designed to take abuse or chewing like Kong chew toys.